clay pavers and natural stone designs. From natural stone to brick and clay, your driveway will be designed and built by an authorized installer of Unilock pavers, recognized industry-wide for elegance and durability. Enhance any area of your property with a functional pathway that provides aesthetic appeal and safe passage. It's the warm welcome you and your guests will love. The central hub of outdoor living, a patio built by Aztec Stone Design brings together your vision, functional convenience and extraordinary visual appeal. The shape, size, material, color and texture may vary, but all Aztec stoops are designed and built around your lifestyle and landscape needs. 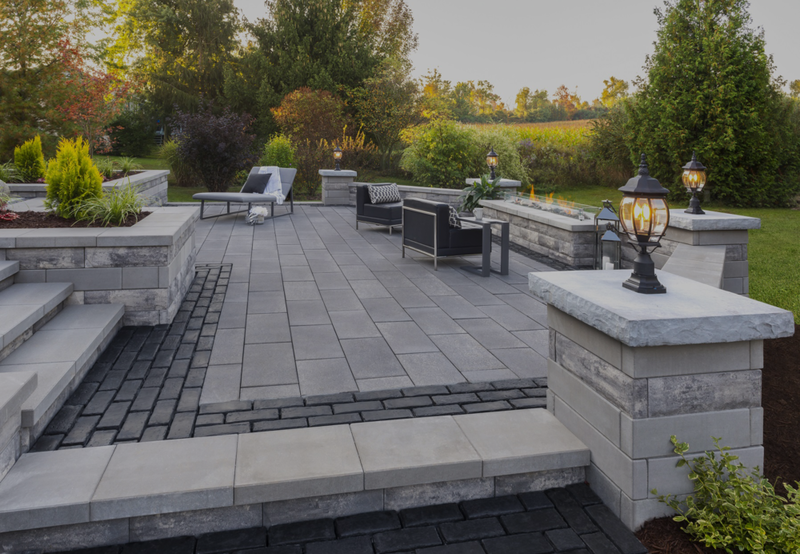 With a thorough evaluation of your landscape and a clear understanding of your individual taste, we'll build a custom wall that blends form with function. Sometimes all it takes is a cool night and a fire pit to bring people closer together. Our fire features provide a cozy gathering spot or a striking element of beauty. Strong, durable and sophisticated, clay pavers are the perfect choice for both surfaces with light foot traffic and heavy vehicular action. When you want durability with an organic look, natural stone is the most versatile choice, and it’s available in the broadest range of colors and textures. Wear and tear are inevitable with even the most luxurious paver installations. Ensure your investment lasts for years to come with Aztec's expert paver maintenance.